This is a scavenger hunt race with a total of 4 different WALDO spoke cards to collect at EACH check point (their will be a designated distributor at each point, but he/she won’t be obvious about it till you find WALDO). 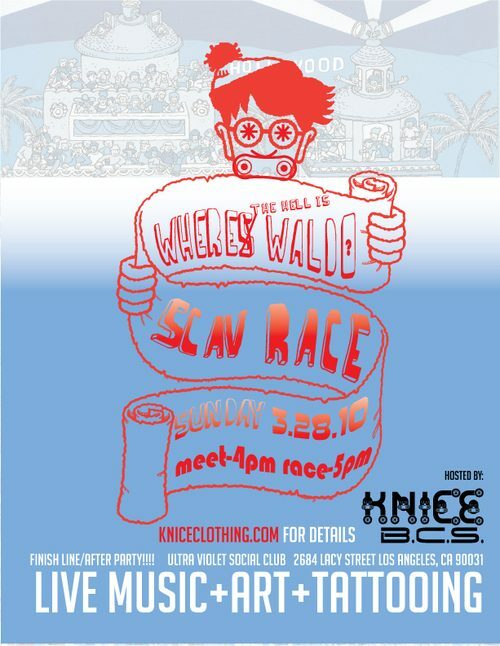 *THE RACE BEGINS 5PM SHARP*, at this point the first WALDO WILL BE GIVEN to BEGIN!!! On the back of each spoke card will be the information to the next check point; including route and clue of were to find WALDO at that check point. 20 MILES total…so burn it. 2. Prizes will be given to the first 5 that make it across the finish line with ALL 4 spoke cards. 1st place will receive a cash prize (amount tba) and his or her choice of KNICE apparel. 2nd through 5th place winners will receive several other prizes to be announced. Come out and join the party if your not racing!!!! There will be MUSIC, LIVE ART, BEER (clearly must be 21+ to drink), and TATTOOING if your feeling ballzy!!!!! Also If you are in the Los Angeles area, please come to the after party!!! Its going to be alot of fun, and the RAUL GONZALEZ Tshirt will be on sale at the event also.